Ture flavour always gives me minerable feeling. Photo courtesy of Nathaniel Mann. 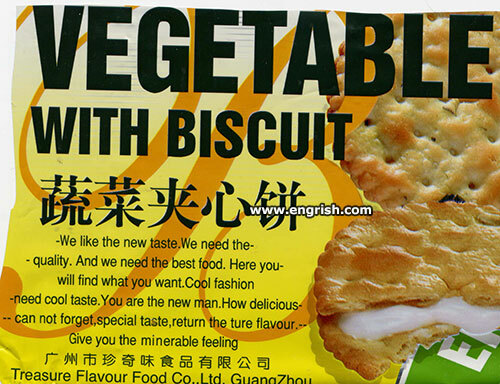 These biscuits make you minerable? I don’t dig that! I’m not sure I want to be the new man, especially if the old one died from producing all the white stuff to fill the biscuits. I told the psychotherapist I felt minerable. He told me to stay away from vegetable with biscuit. My great uncle was called Ture, and although he looked vaguely like turnip, he did not eat biscuits. I think that should have been an ‘s’ instead of an ‘n’ in the last line. I think China now lets an AI produce these descriptions. Unfortunately it still fails the Turing test. Is it animable, vegetable or minerable? I am not a new man. But i can tell you what I most like the taste of. And it’s not these furschunglunger biscuits. If you want a cool taste, fill your lady full of ice-cubes. If you can get her to stop squealing, and jumping around, long enough to do so, that is. Corrrection: The iconic Mad word furshlugginer was derived from the Yiddish word shlogan (to hit), while the meaning of the word potrzebie has been debated by Mad readers and academics for years. Still, that is not a bad memory, for nigh on sixty years ago. For purity reasons we do not add any artificial protein, or amino acids. This is the very potrzebie, of a modern chinese mispronunciation. Well, I guess it beats soylent green….. Think; I am the very model of a modern major General. Sorry again, G & S.
Soyrent Gleen —— Approved by Chalrton Heston. I’m feeling minerable… because I’m the new man! If you want to feel like a miner, move sixteen tons of vegetable with biscuit. @Classic Steve | 10:00 am: And owe my soul to the Treasure Flavour Food Co? Working as a miner is the pits. This Engrish is turely minerable.